Graffiti comes in all shapes and sizes, but finding it on your property is no picnic. Even the smallest of these marks can cause big problems for your home or storefront. Graffiti is an eyesore and can be an offensive deterrent for foot traffic. Instead of having your business suffer or having an unsightly mess on your home, call for our Rocky Mountain House graffiti removal instead. Graffiti is a part of urban life; there is just no getting around it! For street vandals, there is nothing easier than walking into a hardware or department store, grabbing a can of spray paint and spending a night out on the town. Unfortunately, a night on the town for them means a whole lot of clean up for you. Trying to treat your graffiti all on your own can lead to a bigger mess than you started with. Stripping paint with industrial cleaners might seem like a good idea in the beginning but these cleaners do not control where the paint ends up. This means that dissolved or loosened paint can bleed down exterior spaces, enlarging stains instead of removing them. When aerosol paints are used, there is more to it than one painted design. Due to its design, these paint cans produce overspray and bleeding. Treating the more obvious stain is not enough to have your property looking great again. 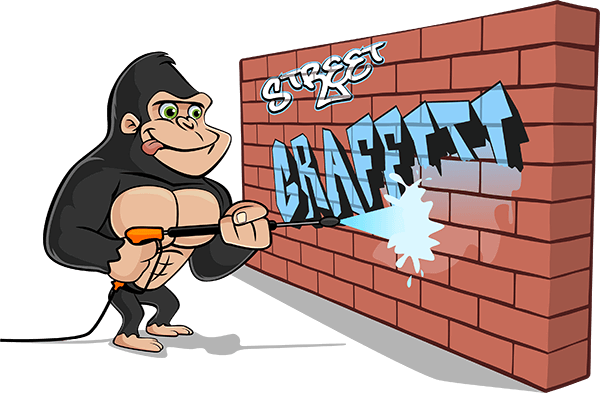 When you want the right results for your Rocky Mountain House graffiti removal, call a Gorilla. When our Gorillas arrive on your property, the first thing that they do is secure the affected area. By quarantining your stain, our Gorillas are sure to avoid paint bleeding and spreading of the stain. A proper Rocky Mountain House graffiti removal begins with a treatment of our eco-friendly Gorilla Foam. This foaming cleanser loosens surface staining, that can be scrubbed away. Once the easy stuff is cleared away, our Gorillas can get to work assessing the severity of your stain. Water soluble paints don’t stand a chance against cleaners and brushes but for more stubborn stains, our Gorillas are equipped with pressure washers and even paint brushes.